As a pet sitter I have heard the arguments, “my neighbor’s cat used to wear a collar but then he got caught on a bush and was stuck for 3 days”, “my cat hates her collar” or “my cat is wild and free, he will never wear a collar”. OK fine – but let me tell you a couple things to debunk the myth about cat collars being dangerous and illustrate how they can and will bring more good than harm. I’m also going to lean on and share some graphics about the cool idea of the Kitty Convict from my friends at Exploding Kittens – there is more behind that name I promise! Um no – its about as dangerous as putting on your seat-belt. Yes in an accident it could cut/hurt you but they save more lives then they take. Thankfully the Journal of the American Veterinary Medical Association did a study on this which proved that collaring a cat is not dangerous. Make certain to share that with anyone you know who thinks collaring a cat is a trap. Also, companies have devised cat-safe collars that break away if a certain amount of pressure is applied to them – technically called “break-away” collars. That way when you adorn your kitty in this collar and they do find themselves hung-up on your neighbors picket fence, it will break free before any choking hazard can begin. People can tell them apart. As a pet sitter I have had to give meds to two litter-mates, both black, both with a little white spot on their chest and both similar in personality. The owner literally said to me, “you can tell them apart because Stella carries her tail in a curl and Pepe does not”. Um, yeah, that is NO help when the two cats are not together. Pepe’s tail is somewhat curved, just not as much as Stella’s but when Stella is hiding in the closet – you lack the ability to compare! People can tell they have a home. I wonder how many cats have 5 or 6 homes, maybe even more? I have been asked to leave bowls out for the “feral” cat at one house only to see the very same cat munching away on another bowl of food left out for him down the street! What a smarty – convince people to love and feed you at multiple houses. People can tell where they live. If your cat gets out or is picked up by a concerned citizen, having at least your cell phone or address on the tag helps your cat get back home. People can tell they might not be allowed outside. Indoor cats DO get out, so if you have a collar, or even better a noticeable reflective orange collar (think of convict jumpsuit color) then people might take more notice – more details on this below. If your cat has a medical condition such as diabetes, it lets anyone that comes across it know – like a medical bracelet. The Oatmeal, co-creators of the card game Exploding Kittens came up with a terrific campaign that goes one step further than just collaring your kitty. They have created the Kitty Convict Project – if you have an indoor cat, dress them in a bright orange reflective collar like a convict. Since 7 million pets go missing each year, the statistics show that more people would report a dog wandering around than a cat. In fact, 26% of lost dogs are more likely to be reunited than cats, who are less than 5% likely to make it back home. 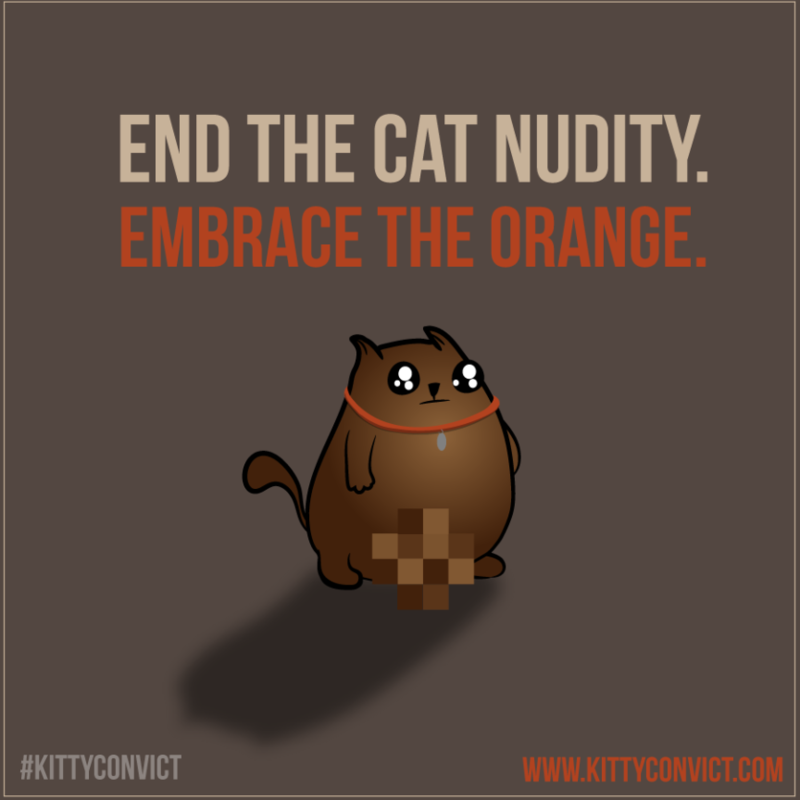 So the Oatmeal, in their clever style and as a way to ask forgiveness to the cats of the world for creating Exploding Kittens (which you should go buy right now), created the Kitty Convict campaign to help more cats get back home. Some people like to think that their cat is fine, it always comes home, everyone in the neighborhood knows where she lives etc. The reality is new people move in – some people will think that a friendly cat hanging around their house may look cold and want to come inside – thus preventing your cat from being able to come back to your home. The flip-side is your indoor cat may have never shown interest in going outside but when you burn the bacon setting off the smoke alarms – the second you open that door Kitty is GONE! Good luck convincing him to come back inside, unless you leave out a bowl of the non-burned bacon and I hope you get your cat back and not the neighborhood wildlife! Keep your kitty collared with an ID tag and always keep tabs on your tabby, or calico, or tuxedo or tortoiseshell etc. Cats are masters at hiding injuries because they NEVER want to seem weak to a human. Make certain you check your cat daily – know what to look for by taking our cat first aid and CPR course. Things go wrong, especially if your cat gets out. You need to be their first line of defense so they can spend more cat birthdays with you.